November 1 is the Day of the Dead. ….Día de los Muertos helps us acknowledge and internalize that we will all die, so that we may live our lives with more awareness and meaning. 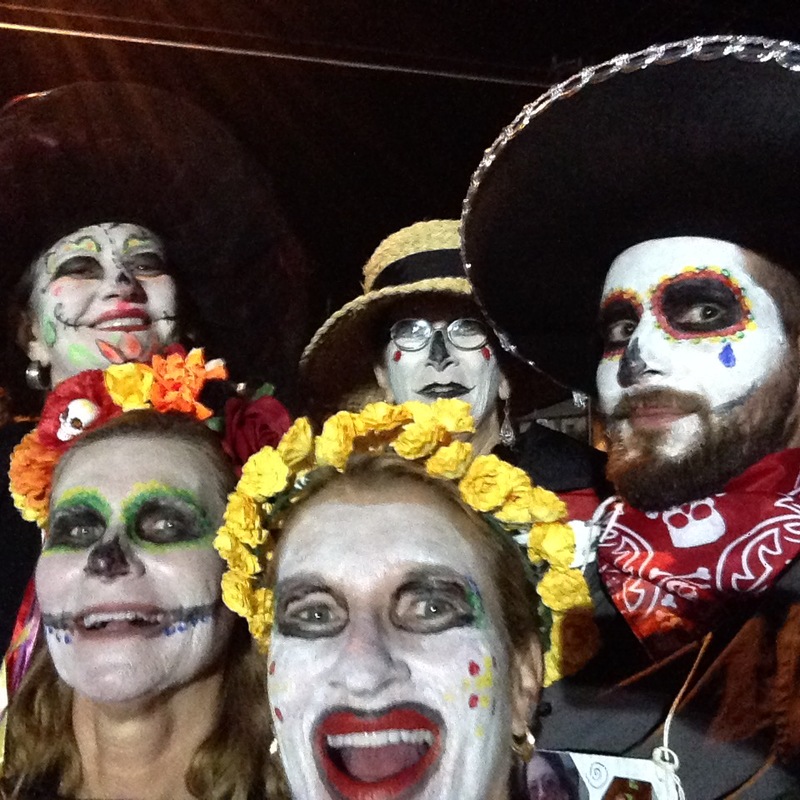 This year, several friends in Arizona donned costumes, painted their faces, and joined the parade to honor the dead. 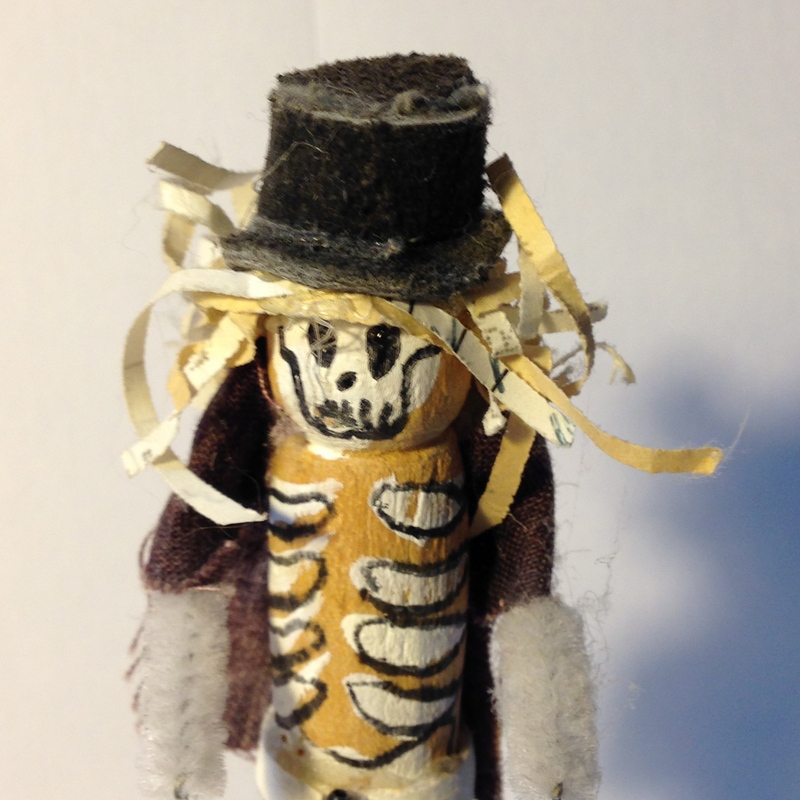 Years ago, while on the High Road to Taos Artist Tour, http://highroadnewmexico.com/about-tour I bought a small Dia de los Muertos skeleton made of a clothes pin and felt. The artist had started an organization to provide art classes to underprivileged children. 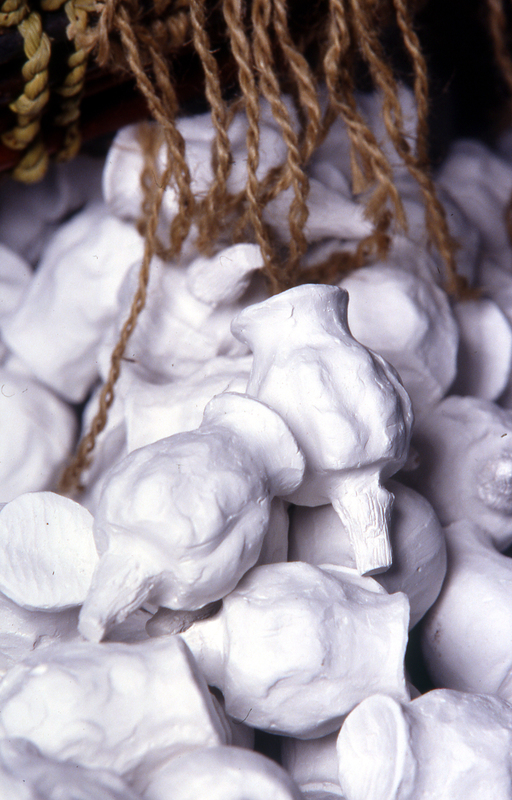 The sale of the skeletons supported her community-based art. I came late to art. I visited my first museum in college. My introduction to art mirrored the feminist movement of the 1970’s. Artwork at that time sought to validate women’s imagery and highlight the lack of recognition of women artists. I read about the Women’s House and the Dinner Party. 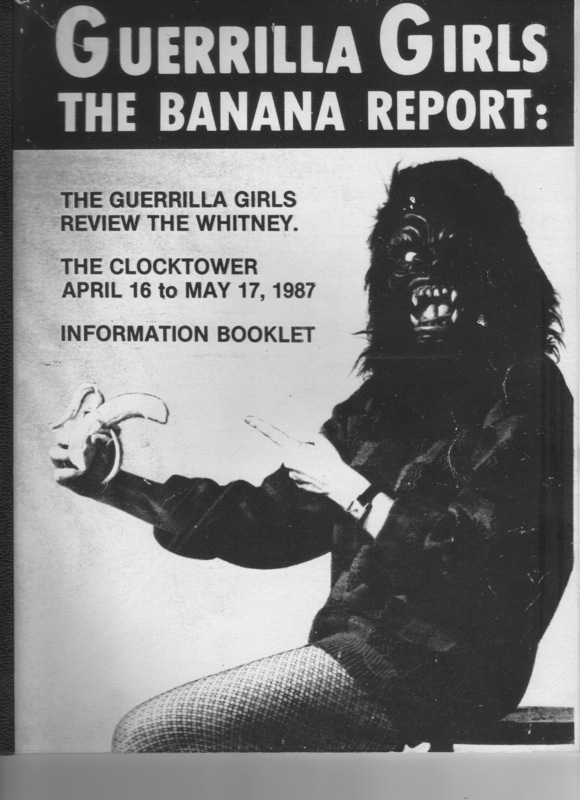 I attended an opening of The Birth Project and sat in the audience as the Guerilla Girls “banana-ed” MOMA and other museums. http://www.judychicago.com/gallery.php?name=The+Dinner+Party+Gallery. Community-based art seemed a possible answer to the loneliness of making art while at the same time, making art meaningful to the community. 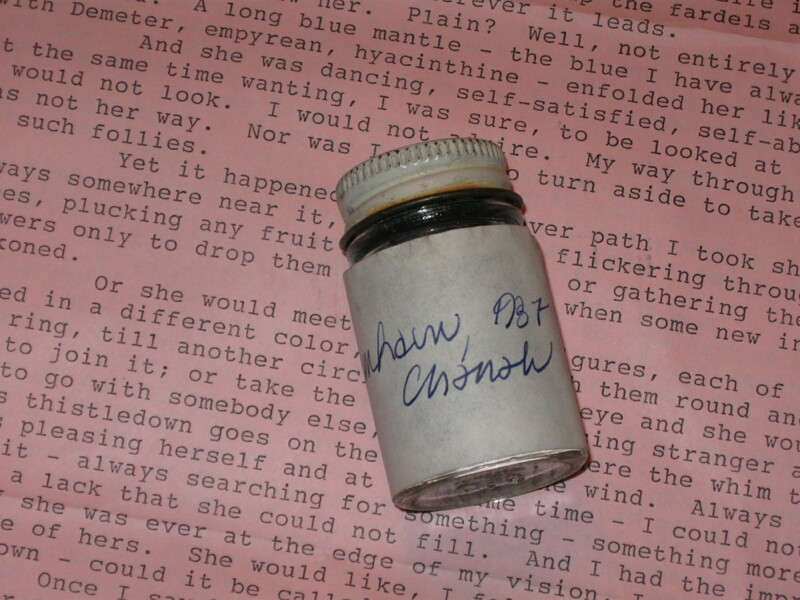 I was cleaning out a closet and found a small jar filled with ashes along with a letter …..The label read: Samhain. 1987. Signed by you. It has been 27 years since I created my first community-based artwork: Samhain. My dad died early in the morning of November 1, 1987. I set fire to the sculpture I had created during the 9 months my dad was dying. Attendees added pieces of paper – photographs – small objects to the flames. We stood in silence watching as the flames died and the ashes cooled. Each person then took a vial of ashes home. I have no photos – just charcoal from the burning…and the memory of that shared experience with friends, artists, and members of the community. Other community-based work evolved. On my long flight back from visiting the Neolithic goddess temples of Malta, I began the planning for what became a year-long project: Seeds of Change – community based art to feed the hungry. Food for Thought: Food for the Hungry highlighted issues of rural hunger through a series of pancake breakfasts and “test your knowledge” placemats examining the misconceptions about poverty, hunger, food insecurity, food stamps, etc. 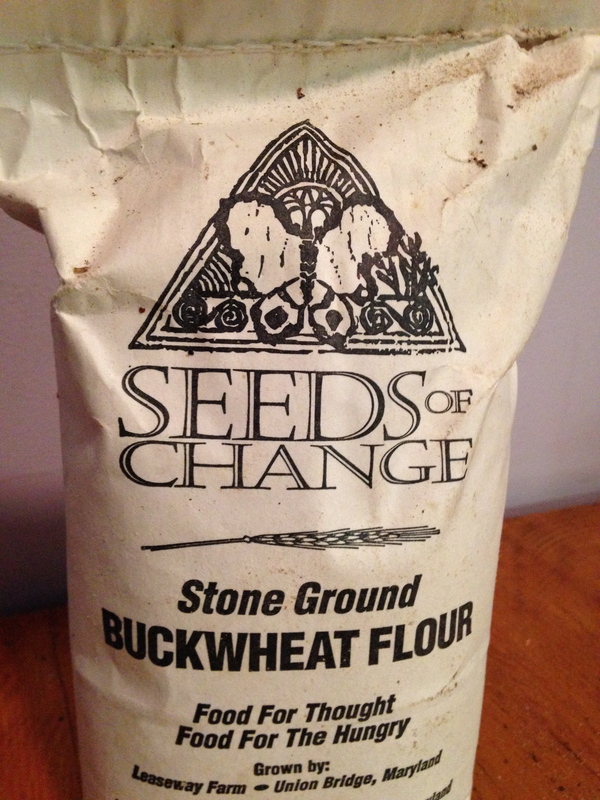 The pancakes were made from buckwheat flour grown and milled locally. As part of the focus on hunger, I conducted an “archeological dig” and created a “museum exhibit” filled with “ancient” sculptures that reflected the beliefs of the Neolithic goddess culture to care for the earth and its inhabitants. It has been 30 years since I bought my first “real” artwork. I paid for it in installments. 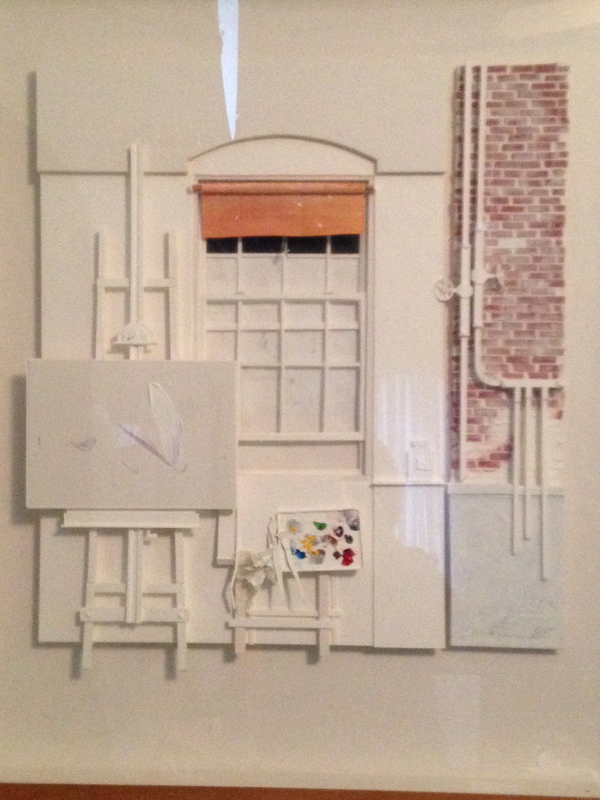 It was a 3-dimensional work depicting an easel, a brick wall and an arched window created by Guenther Riess. http://www.nytimes.com/1986/09/07/nyregion/westchester-journal-art-and-construction.html. It has been 20 years since I moved to the Firehouse. When I walked into the building, it became clear that this would be my home. Site-specific art is artwork created to exist in a specific locale and integrated in its surroundings. 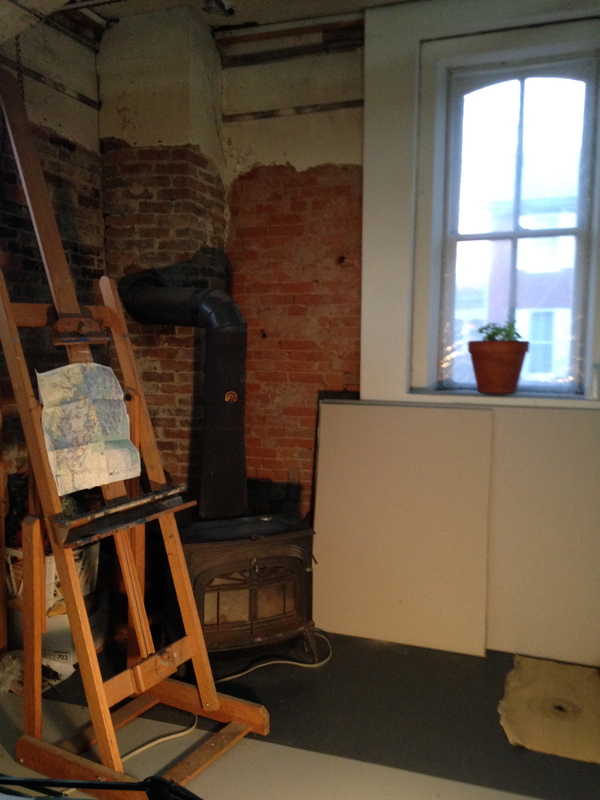 I jokingly refer to my Firehouse Studio as my largest site-specific work to date. Each institutionalized for all or part of their life; Each leaving only an invisible legacy in the form of untold stories, unactualized lives and unrealized dreams. When the ink on vellum was scraped off in order to reuse the vellum, traces of the old lettering bled through. This was called Palimpsest. 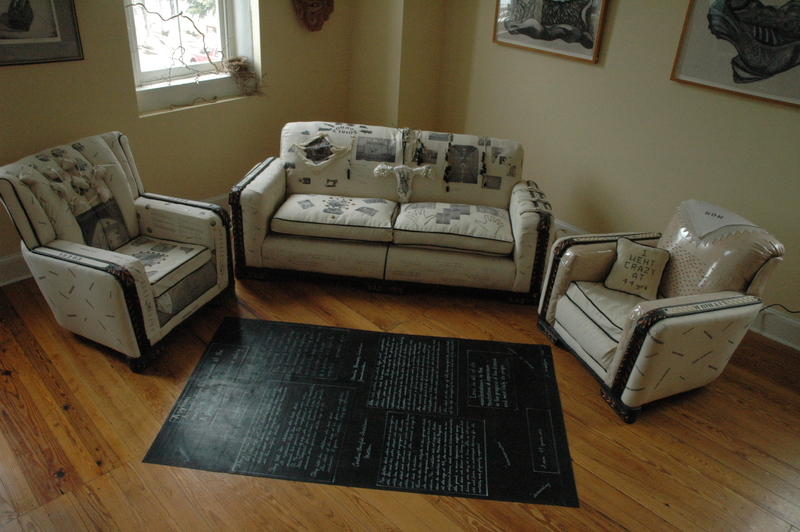 From 2000-2003 I created a series of work in which underlying histories – public and private – at one time ‘erased” – would be brought to the surface. 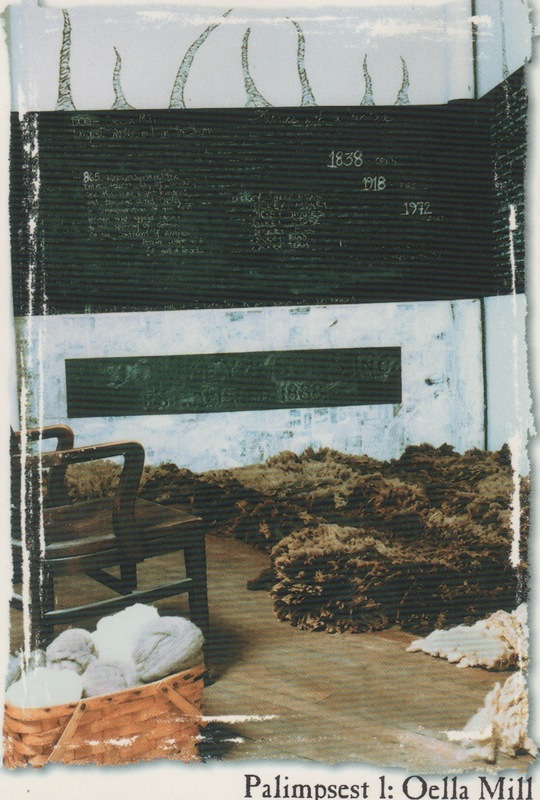 Palimpsest: Oella Mill (2000) examined the history of the Maryland cotton and wool industries through mill worker oral histories. I used raw wool, chalkboards and drawings to describe their lives as millworkers and the impact on the local environment. I examined the politics of the cotton and wool industries from sail making to war uniform production. I also learned a great deal about the life cycle of moths when I received a substantial invoice for their extermination. Crater Lake National Park (Oregon) is one a magical place. The lake appears as a deep blue mirror that reflects passing clouds. Crater Lake filled a volcanic depression (a caldera) that formed when the Mount Mazama volcano erupted approximately 7,700 years ago. http://www.nps.gov/crla/index.htm. At one time, the land and the lake belonged to the Klamath tribe. But ranchers were allowed to drain local wetlands to provide land for grazing cattle. And the habitat for the wocus plant – the main stay of the tribe – disappeared. The U.S. government then “terminated’ the tribe. 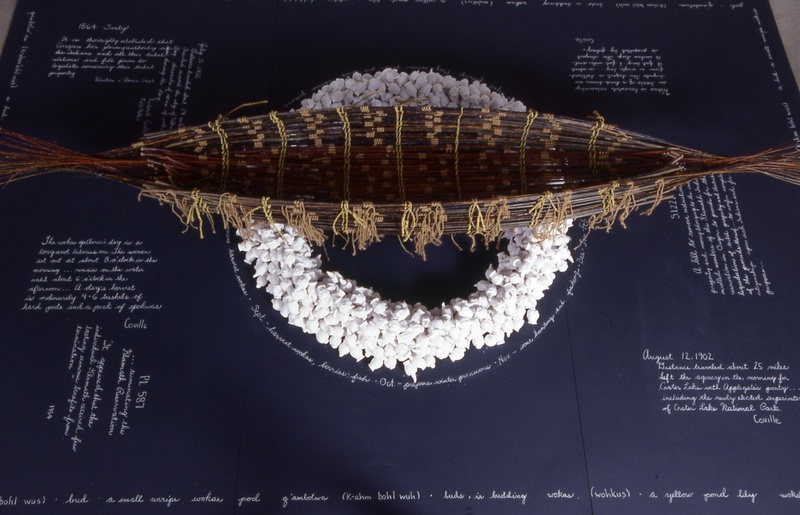 During a residency at the lake, I researched the history of the termination of the Klamath tribe, interviewed members of the Klamath tribe, gathered tule grass to weave, and created a work that depicts both “versions” of the history of the land and its peoples. My artwork often focuses on a little known moment in history that reflects larger issues within a contemporary context, The Maine Jewish Museum has accepted my request to create a site-specific community based work for a September 2015 exhibit entitled: “Welcoming the Stranger.” – hachnasat orchim. I want to weave the names of those once detained on House Island into the fabric of our history. I want to mesh the stories of 1920’s immigrants to Maine with those arriving today. I want to document Bela Gross’ quest to be an American citizen and compare it to the quest of current asylum seekers. I want to learn more about each of the National Council of Jewish Women members who helped early immigrants integrate into the City of Portland. I want to honor those who “Welcomed the Stranger” almost 100 years ago in hopes of encouraging us to do the same today. Planning Board Public Hearing, November 25, 7:30 pm. 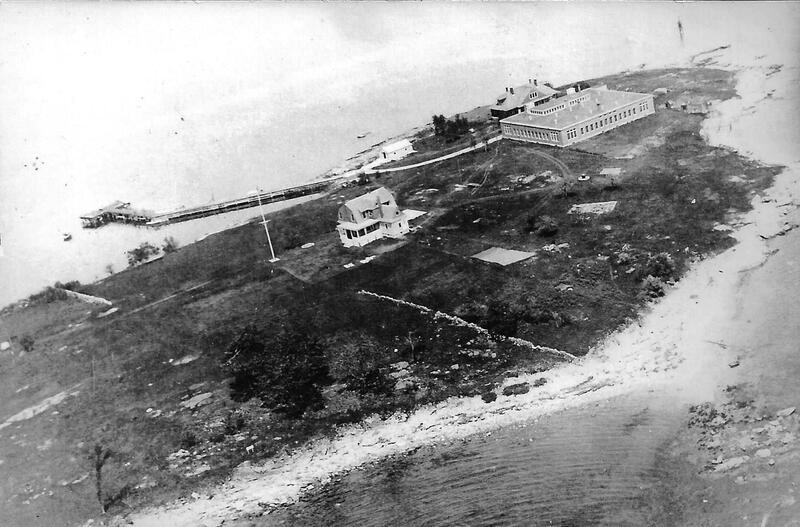 The City Of Portland Planning Board will hold a public hearing regarding the request for historic district designation of House Island. If you cannot attend, please send comments to Deb Andrews: dga@portlandmaine.gov.